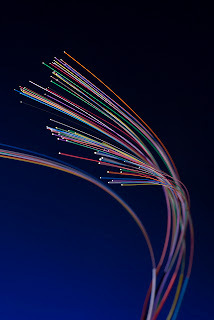 Well, the fiber optic technology is amazing and there are no doubts about that. And it's already in action at Kensas city where Google launched crazy 1000 Mbps Fiber Internet using this Optical Fiber Technology. But ever wondered what this optical fiber technology actually is? One thing that we can get with this "optical" word that there must be light that is involved in this revolutionary technology. And if you guessed that, you're absolutely right. It's about converting the source of information, which is usually in electrical form, to the form of light before transmitting it to the fiber (The cable which carries light in it!). Now the another question might strike to your mind that what about the unbelievable speed that it supports? Well, the logic is quite clear. As we all know, the light travels at the speed of 300000 km/sec which is faster than our imagination. And as we're converting our information signal to light, it's quite obvious that it will travel at the speed of light to provide us such high bandwidth. So at the note of this, we've a YouTube video uploaded and made by engineerguyvideo which explains the work of Fiber Optic Cables in a very easy manner. Enjoy the video. If you really liked the video, take couple of minutes to subcribe to engineerguyvideo, as this engineer has tons of video to show you how things work! Personally, I'm fan of him and I'm doing my bit to promote his YouTube Channel.